Kansas City SEOBlogSEOGoogle Stock Price VS Algorithm Updates: Positive Correlation? In other words the perceived message is that if organic search engine rankings are getting harder and harder to achieve – since Google is making it harder for search engine optimization service providers to influence organic rankings – then maybe the only way to achieve consistent, sustainable search engine visibility it to “pay per click”. Yes: Google’s algorithm is permanently, directly and inextricably correlated to Adwords. The company does not charge any fee for a website to be listed in its search engine index or within its Google Plus social network (and Google Maps) which drives many local search results. Adwords, on the other hand, drives well over 90% of the company’s revenues. This is not a misprint. Most people, even within our own industry, do not realize of Google derives almost all of its revenues from its pay per click services. AdWords only has value in its connection with Google’s organic search feature. Users do not search Google to get access to paid advertisements. Internet users, by and large, place a high degree of value on organic rankings. They believe that top ranked pages and websites are listed first because of quality, merit, reputation and relevance – rather than just being a paid listing. Since AdWords only exists and thrives because of organic search, it’s an absolute fact that every single Google update has a potential impact on the company’s stock price. As a public company, Google has to do everything in its power to maximize Adwords revenue. Yet, the best part about Google is that the company, by nature of its free and paid services, is its own best watch dog. While they will always push the envelope to grow Adwords revenue, they must also always be sure not to cannibalize their own revenues by diluting the value of organic rankings. Once Internet users lose faith in their search engine, either because web spammers have hurt search result quality OR because Google gets too aggressive with Adwords promotion, people will stop using Google â€“ or the door will be opened wide enough for a new player to enter the space. The title question of this post has to do with major search engine updates and how then may relate to Google’s stock price. Can we glean any information from Google’s update history in the Panda and Penguin era and correlate any of these updates to changes in stock price? Maybe. For some of the major updates, it seems more than coincidental that Google’s stock price rose shortly after some of the biggest reported updates. While AdWords revenues are not reported this quickly, it seems like tech savvy investors have sensed a correlation and may be buying when major updates are reported by the SEO community. This would make perfect sense: when a business loses organic rank overnight, sales and phone call inquires can stop on a dime. The only option for many businesses is to start or increase spending on AdWords. While ranking winners will offset the losers, it may be the severity and frequency of ranking reshuffles that provides a boost to AdWords and bring more customers and accounts into the fold. 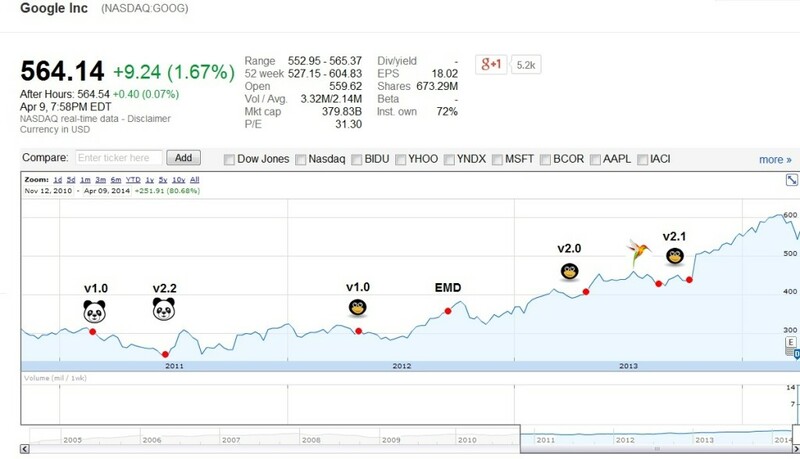 As you can see from the graph below, Google algorithm updates have been followed by stock price spikes. While there have been dozens of other major to moderate updates, and thousands of minor updates over the last three years, you can clearly see stock increases around some of the more talked about, major updates. Google already has a monopoly on organic search – so its unlikely that more people are searching….because pretty much everyone already uses Google. Something is causing more people to spend on AdWords over the years and it may be related to the volume, frequency and severity of algorithm updates. It will be interesting to watch for Panda #26 or Penguin 2.1 or Penguin 3.0 or Penguin #6 or whatever they end up calling it.